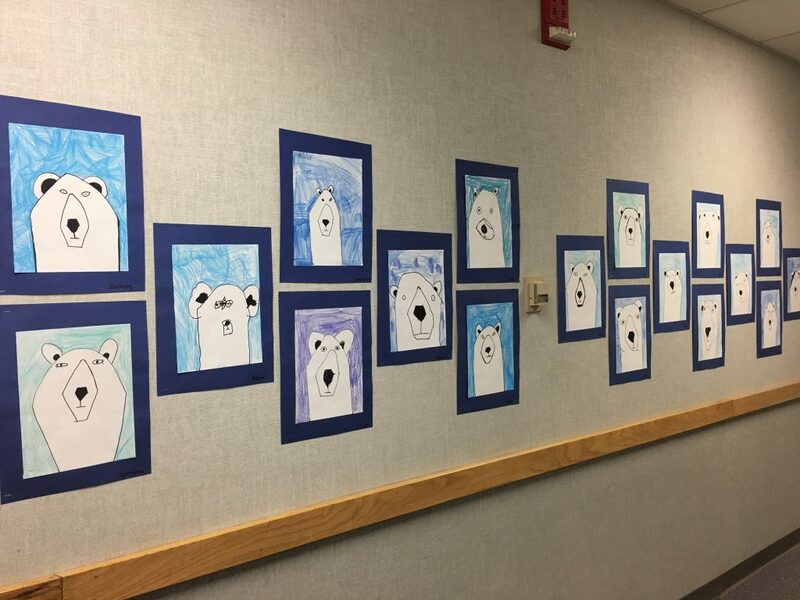 Drawings of polar bears and maps of the Arctic region decorating the hallways signal the arrival of March at our school. 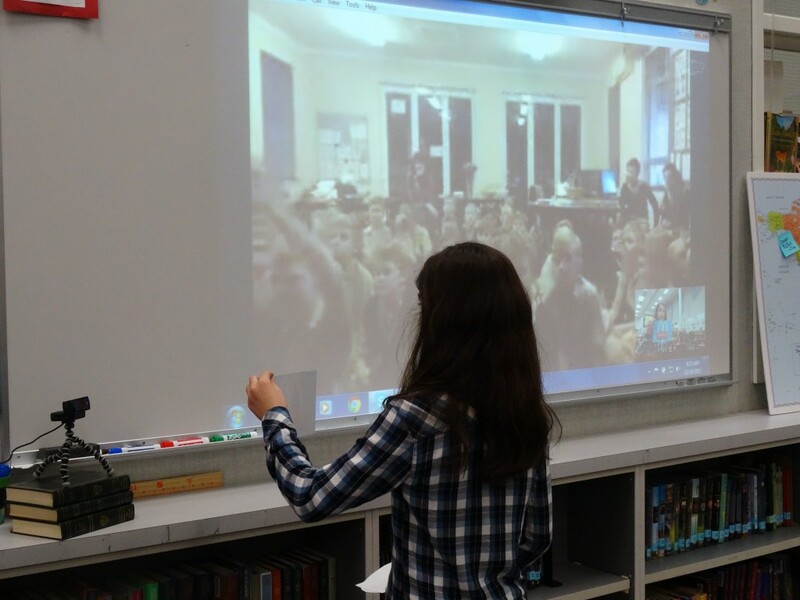 So when I read the announcement that teachers could sign up to Skype with one of the polar explorers at the UK Arctic Research Station in Ny-Ålesund, Svalbard, the most northerly permanent settlement in the world, I registered immediately. 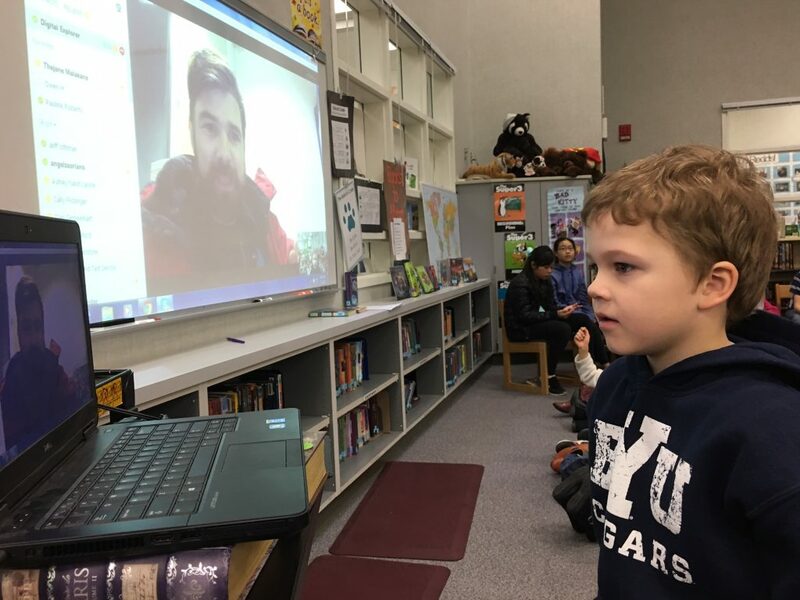 I am a teacher-librarian and know from many previous Skype sessions that an experience like this would be an inspiring launch activity for the first grade study of the Arctic habitat. The first grade teachers when our application was accepted. 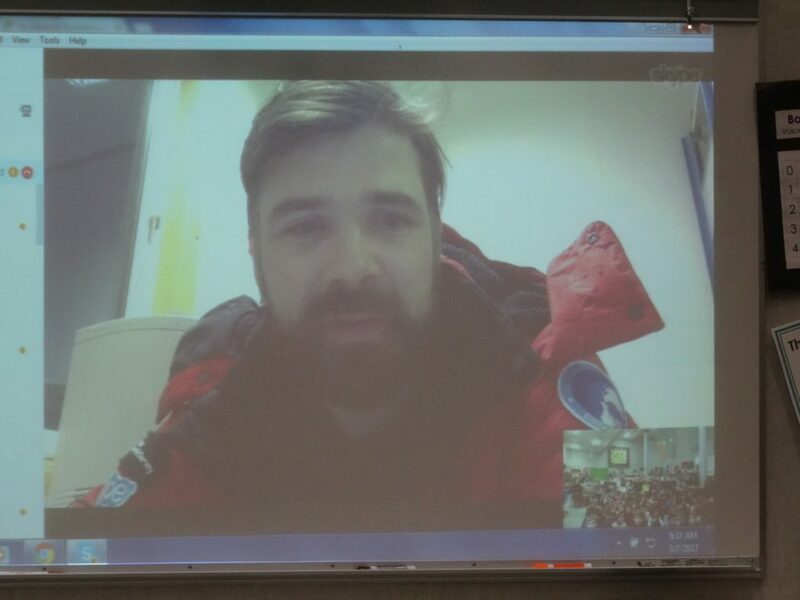 To prepare the students we told them that they would be speaking with a polar explorer who would tell them what it’s like to work in such an extreme location. 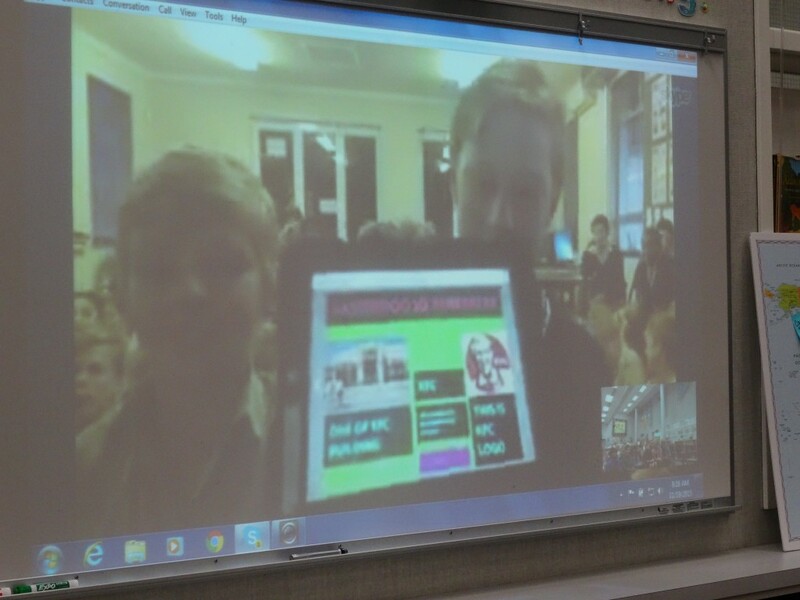 The students prepared questions they wanted to ask Jamie Buchanan-Dunlop, the Director of the Digital Explorer program. The questions needed to be ones that weren’t readily answered on the internet. 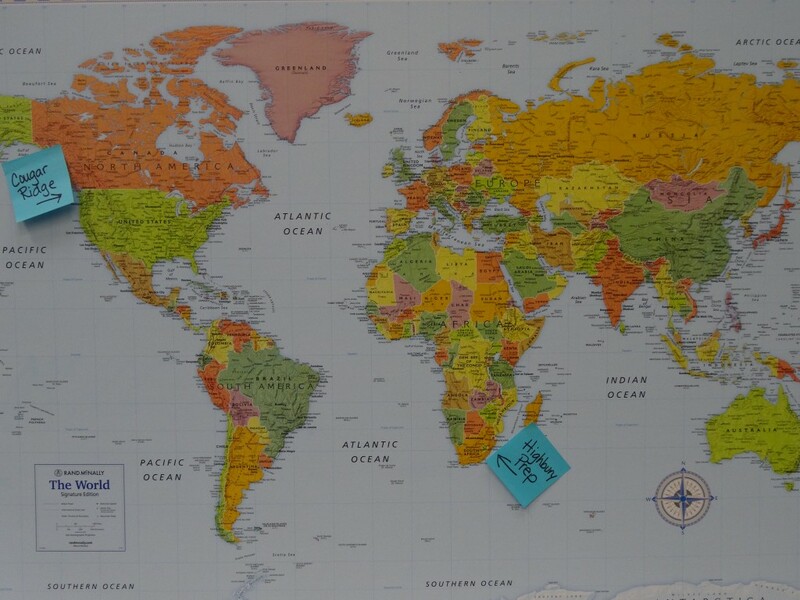 On the day of the call, my students learned a lesson about time zones that they didn’t expect. When you Skype in the morning from the west coast of the US with a person who lives nine hours away, you can’t see anything outside because it’s already the early evening. While the students were disappointed that they couldn’t see the landscape, they were thrilled about the question and answer experience. 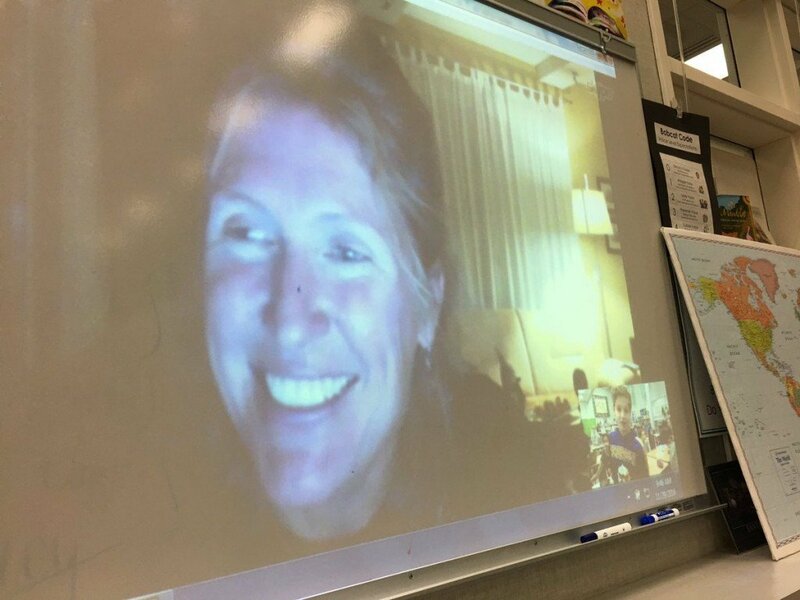 Jamie started off our Skype call explaining that the polar scientists were researching how glaciers are changing over a melt season and how they might change in the future and the impacts that might have for sea animals in the area. Then we started our question and answer segment. One boy about the thickness of the sea ice we were surprised by the answer. There is no sea ice at all around the island at all. In fact the temperatures are so warm this year that their most difficult problem is not bone-chilling cold, but rather rain. The rain, fog, wind storms and murky days are affecting the equipment and causing a completely different set of problems. 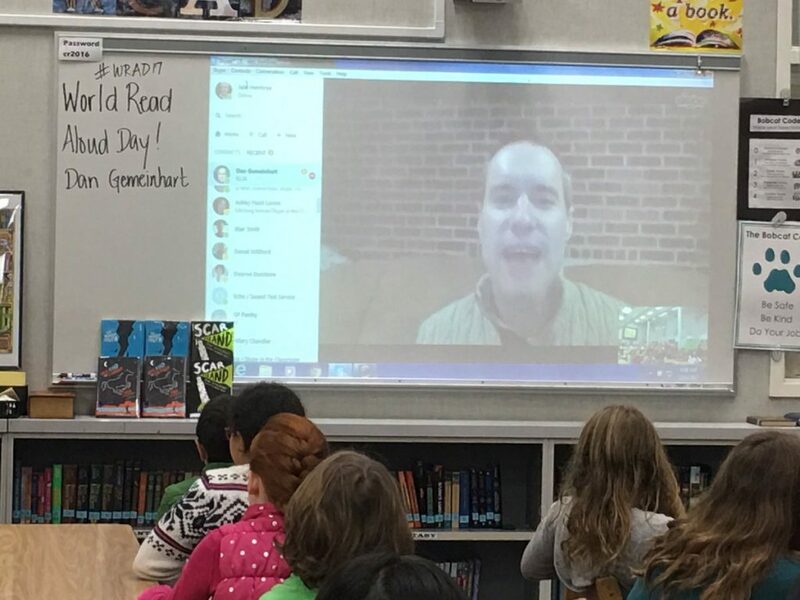 Jamie answered numerous other questions about how they protect themselves from polar bears, working in the extreme cold, and their recycling and composting procedures during our twenty-five minute Skype call. When one boy asked if they put ice in their drinks there, we learned some fun facts about iceberg ice. Jamie’s answer got lots of giggles from the crowd. Apparently iceberg chunks make a fun hissing sound when the ice melts in water and the air is released after being trapped for thousands of years. For many children, that single ice chunk story will be the one the children remember from the experience and that’s okay. 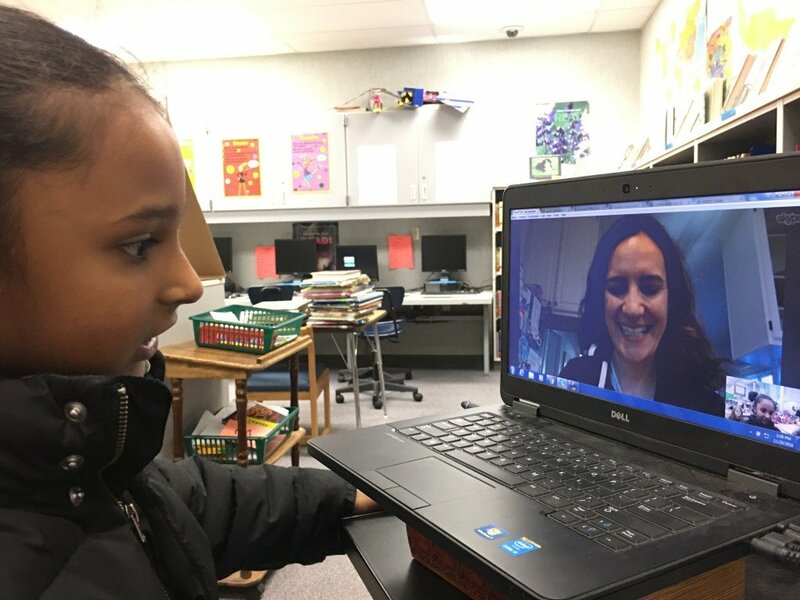 These conversations with scientists thousands of miles away highlight the impact of virtual field trips. The likelihood of any of us actually traveling to the Arctic is slim at best. 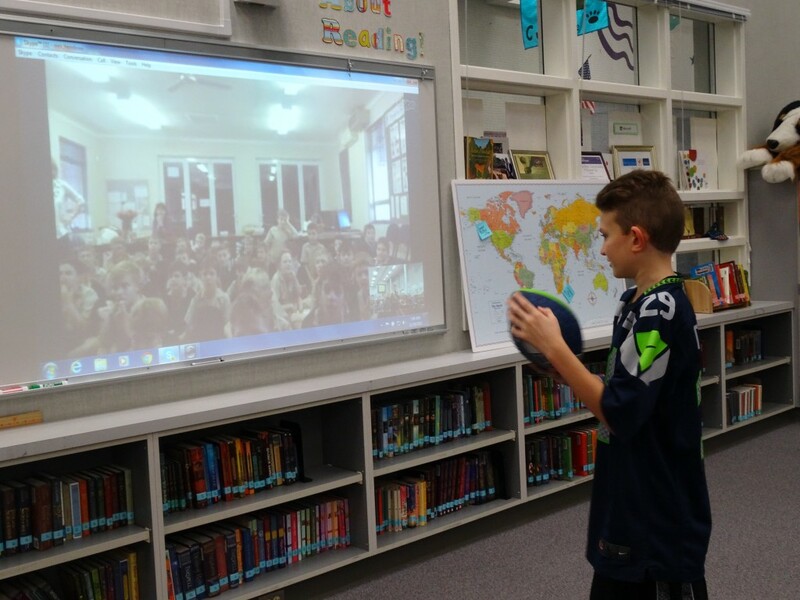 However, through Skype virtual field trips, students can have the next best thing. They can virtually be in Svalbard, talk to the experts in the field, and experience science as it’s happening in the moment. We ended our call with cheers and claps. Comments like “That was awesome!” “It was fun!” “The best day ever!’ “I loved it because he (Jamie) can explain things to us.” let us all know the impact of the experience. 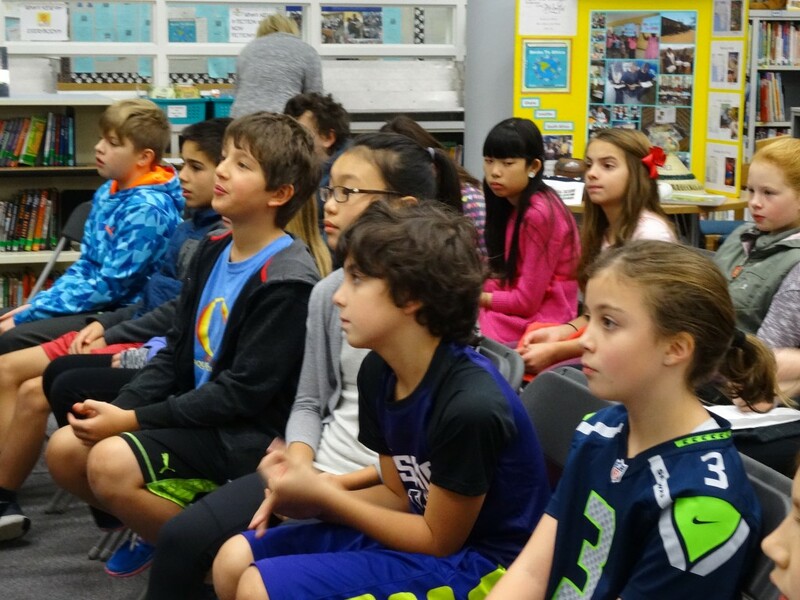 Indeed, the lessons from this virtual Skype field trip extend beyond the call. 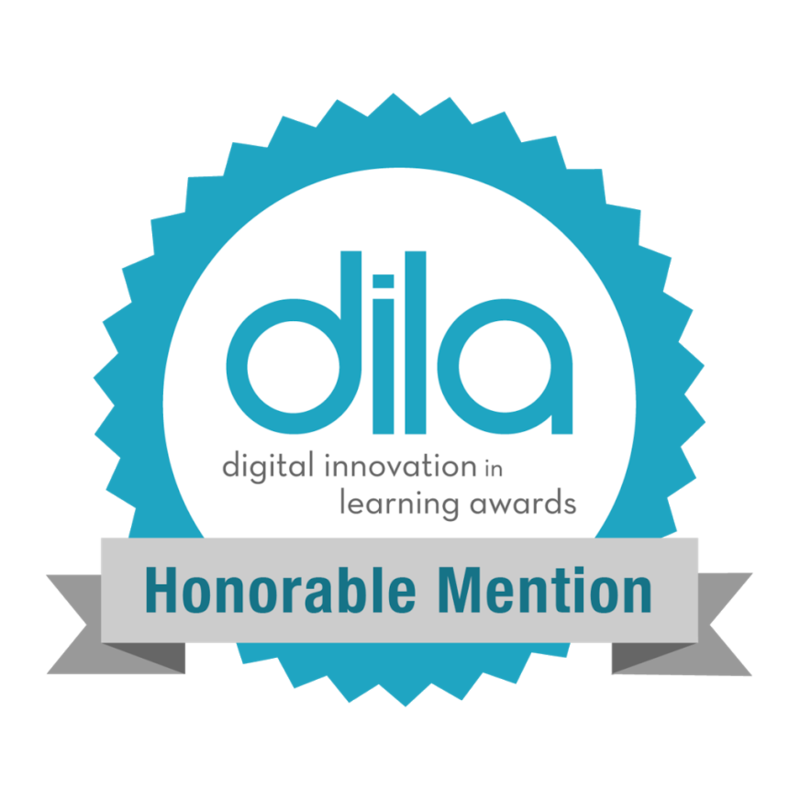 The Digital Explorers have created frozen ocean resources which teachers can download and use in their classrooms. When our students started studying polar glaciers in class this week, they were able to view a 360 view of a scientist rappelling into a glacier from the UK Arctic Research Station in Ny-Ålesund. 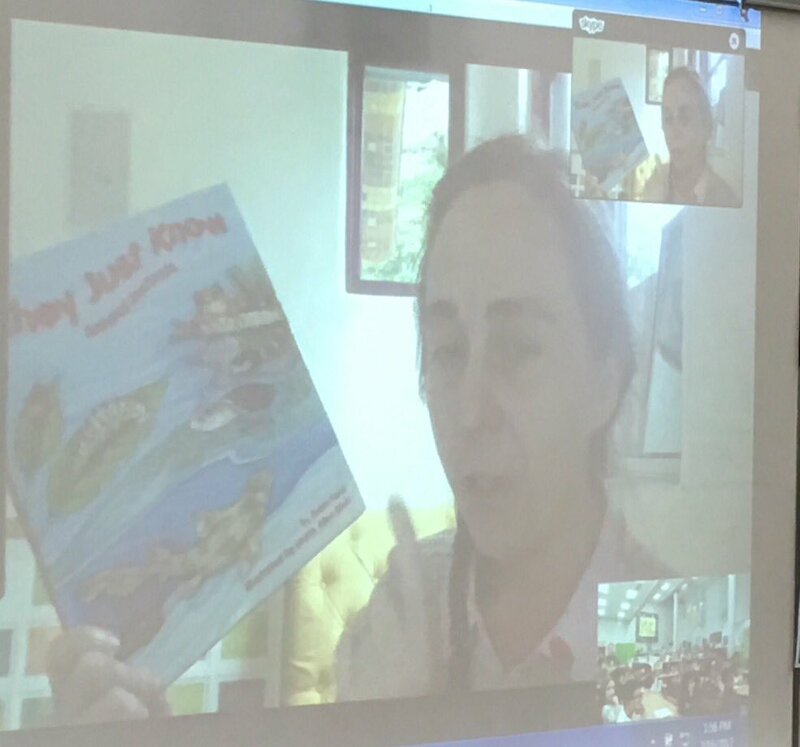 As One little boy told me, “It was fun because we actually saw him and didn’t just see it in a book.” Skype in in the Classroom can bring learning to life! 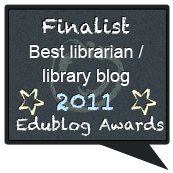 This post was cross published on the Skype in the Classroom Blog. 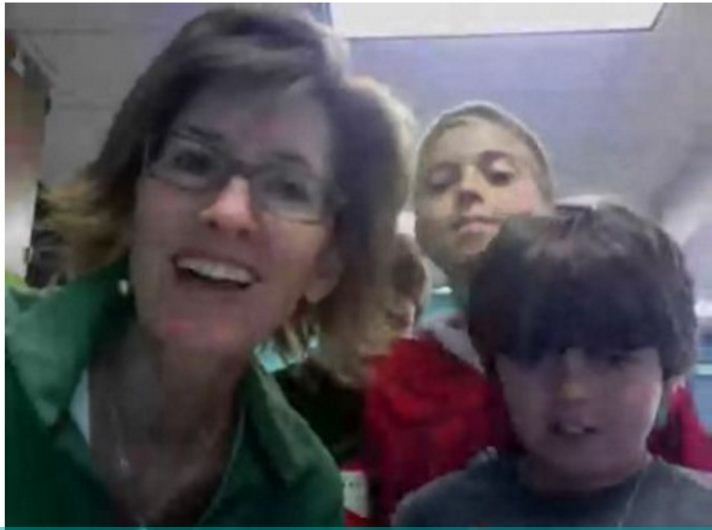 I love Skype so much that earlier this year I submitted this Sway to apply for the Skype Master Teacher Program. 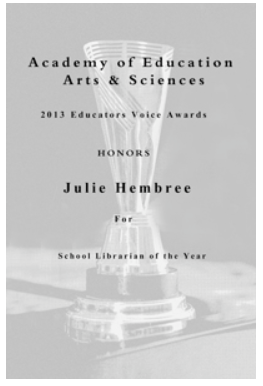 In September when I received this email I was thrilled by the news! 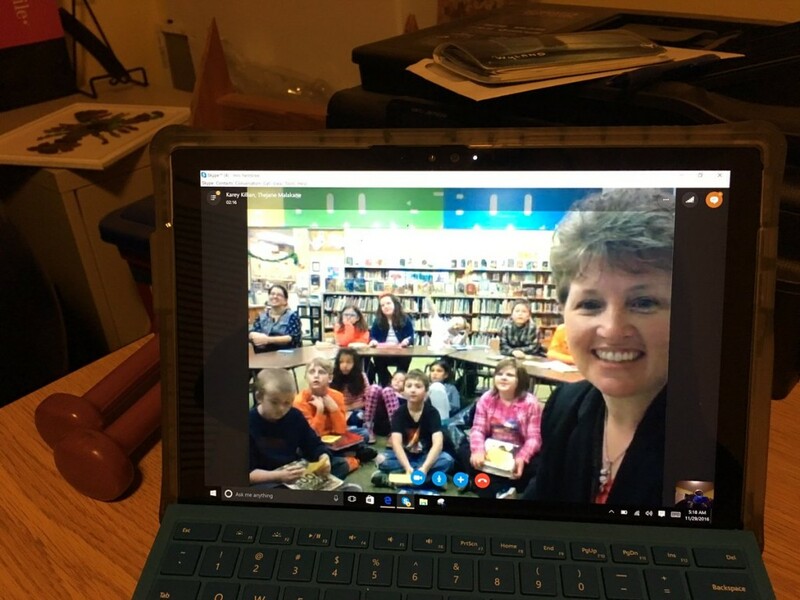 So what does Skype do for my library classroom? It flattens the walls. 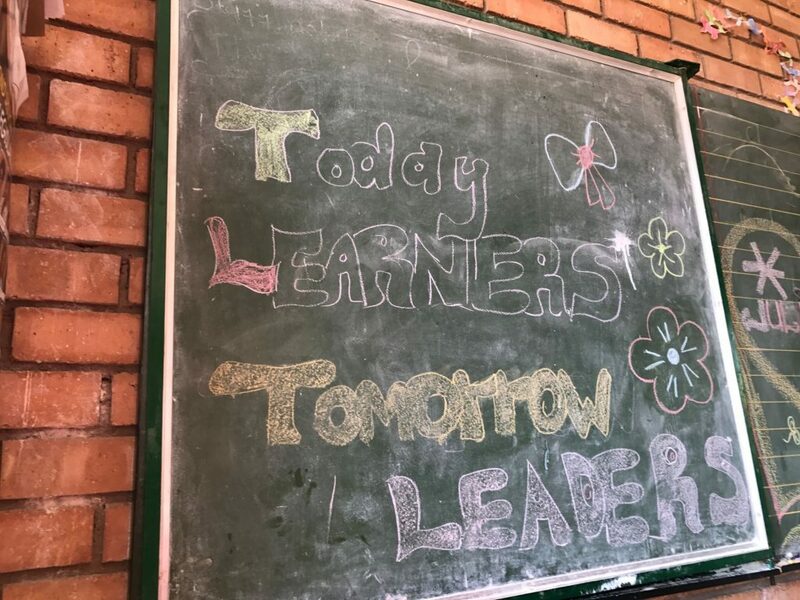 In the past, classrooms have been limited by the literal space where you teach or opened by neighboring classrooms within your school. 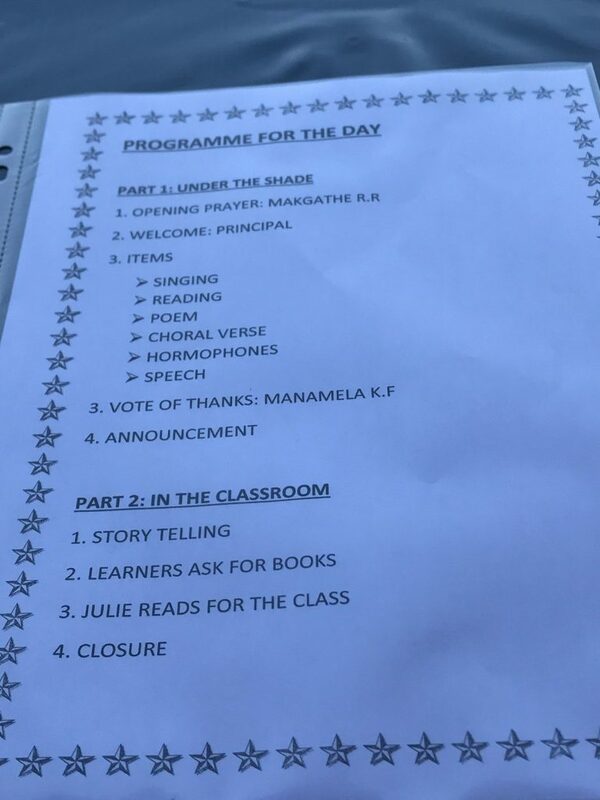 Teachers taught with the doors closed from the beginning of the day to the end. 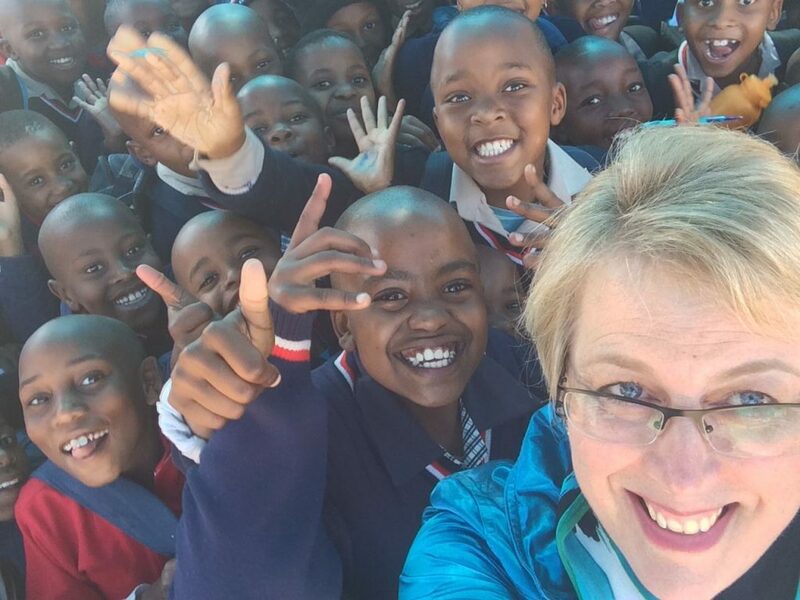 Occasionally a guest might come into class or the group would go on a yearly field trip. 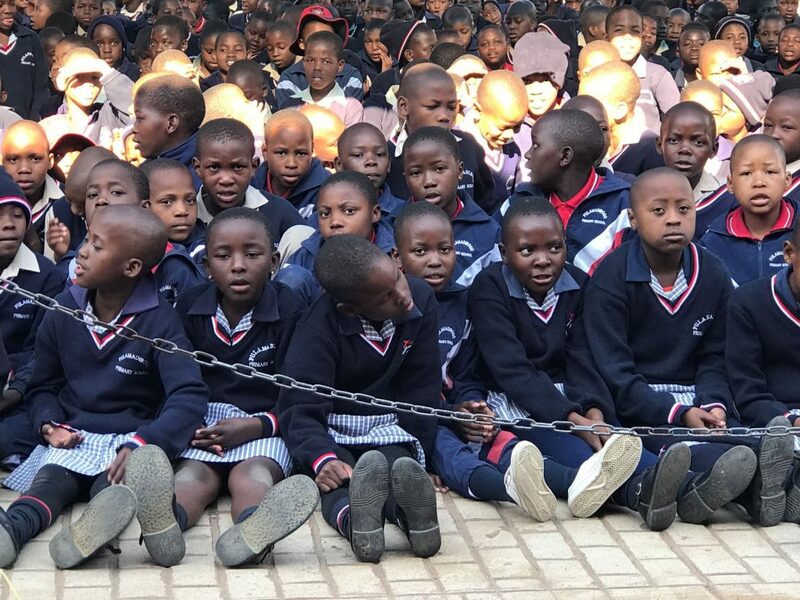 However, for the most part, the education of that room of students was essentially closed. 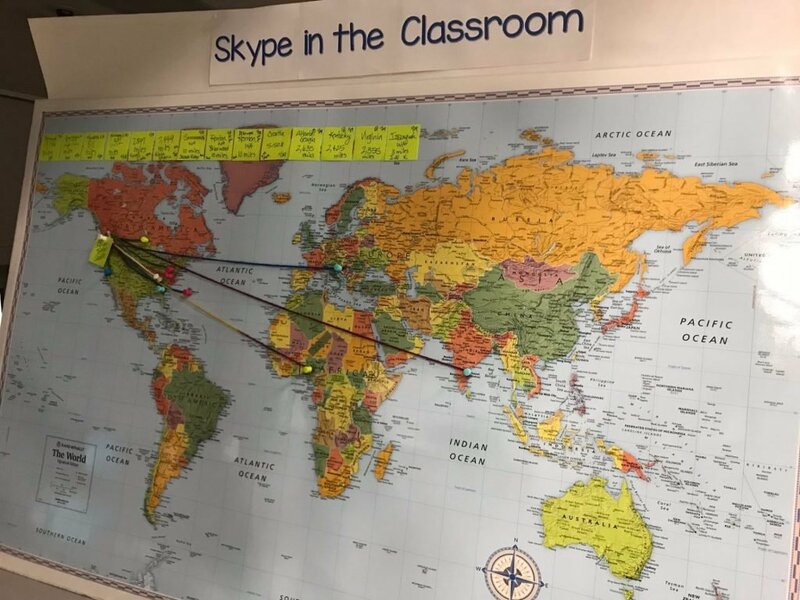 For any teachers who use Skype (or other connection capabilities GoogleHangouts, Seesaw, Edmodo, etc) have seen those walls crumble and the outside world come in. 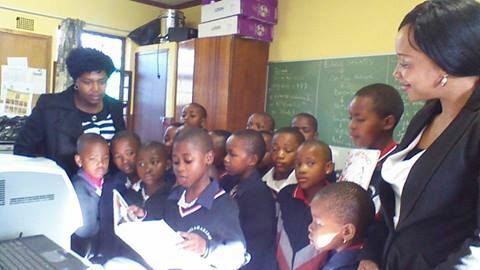 My first experience in 2011 was with Mrs. Linda Yollis’ class in Southern California. 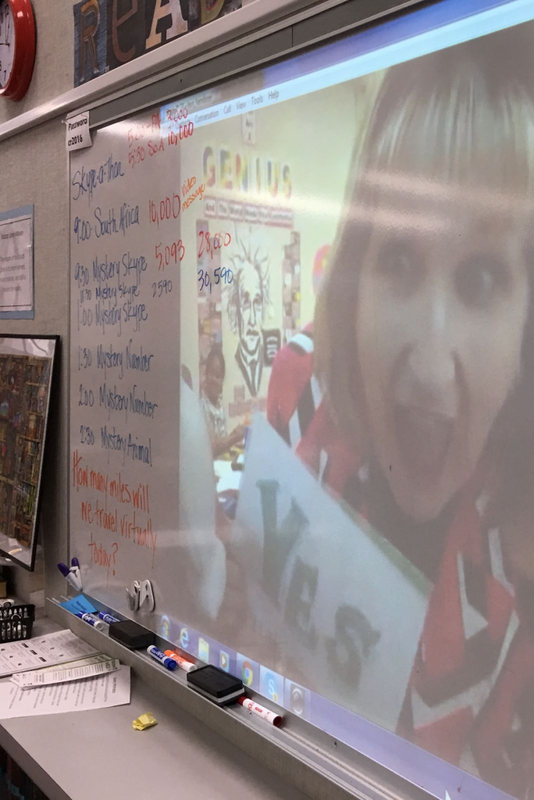 We played Mystery Skype – a game where each group of students tries to guess where the other classroom is located through a series of yes or no questions. 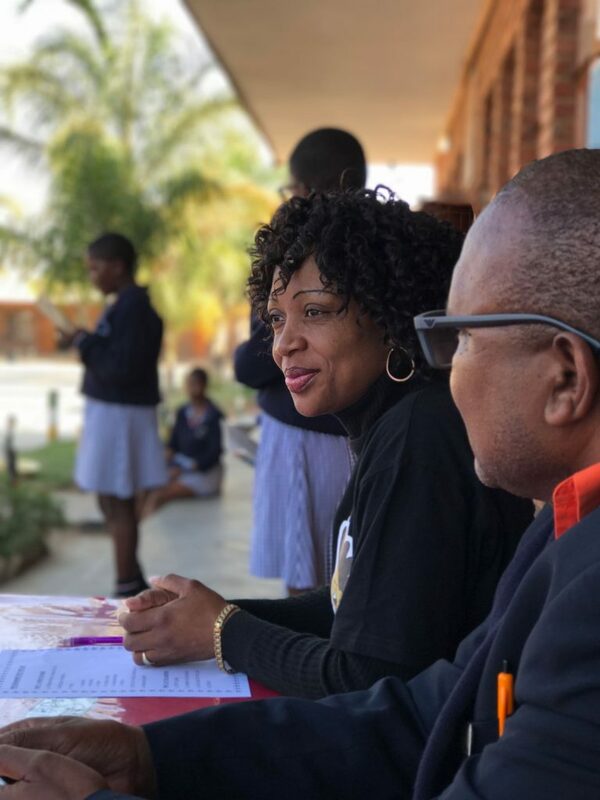 The game requires students to use critical thinking skills, map reading skills, problem-solving skills, cooperative learning and communication skills as well as practicing proper digital citizenship and etiquette. The lessons are powerful and fun. 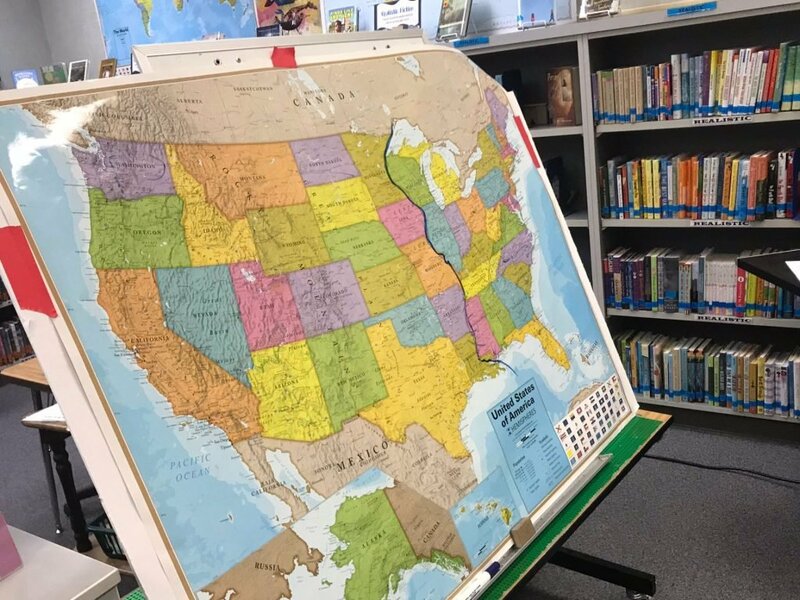 Students who are experienced and know how to carefully craft their questions, can generally guess where the other classroom is out of all 50 states in less than 10 questions. Sometimes they can do it in only 5 questions! 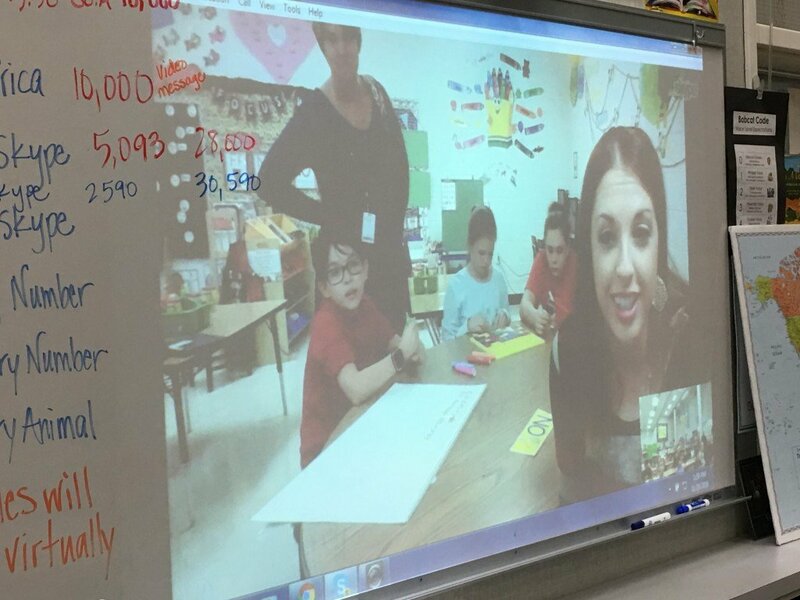 In the years since we have Skyped with paleontologists, scuba divers, authors, and students in Africa, Europe, all over the US. 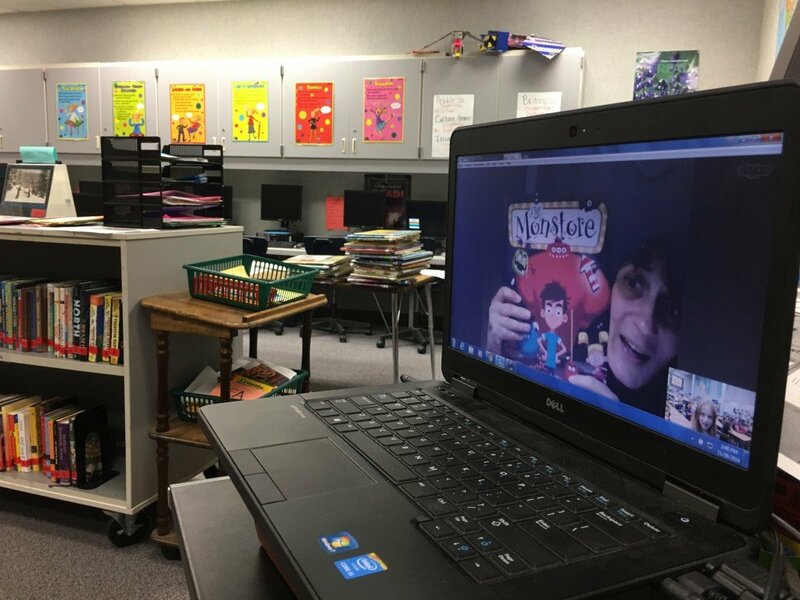 As a Skype Master teacher my goal this year is to give every one of my classes the opportunity to Skype at least once during the school year. 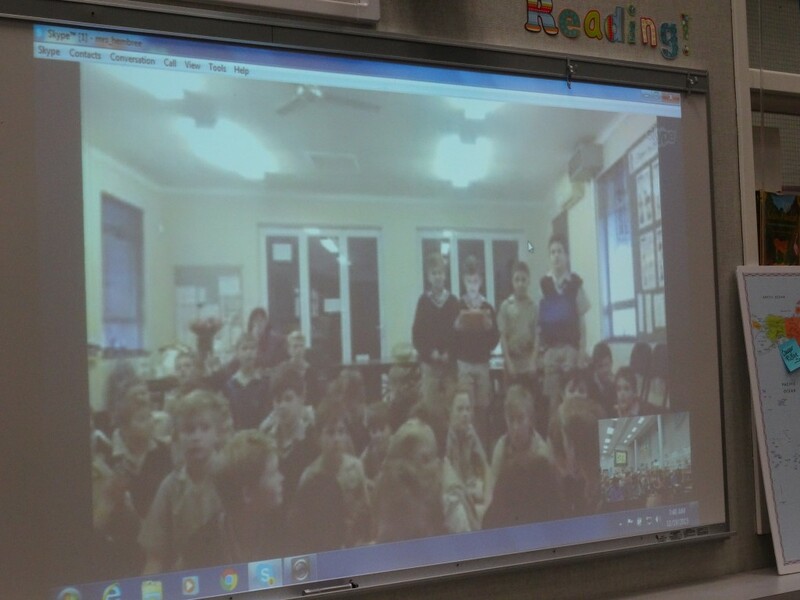 We have played Mystery Skype twice already. 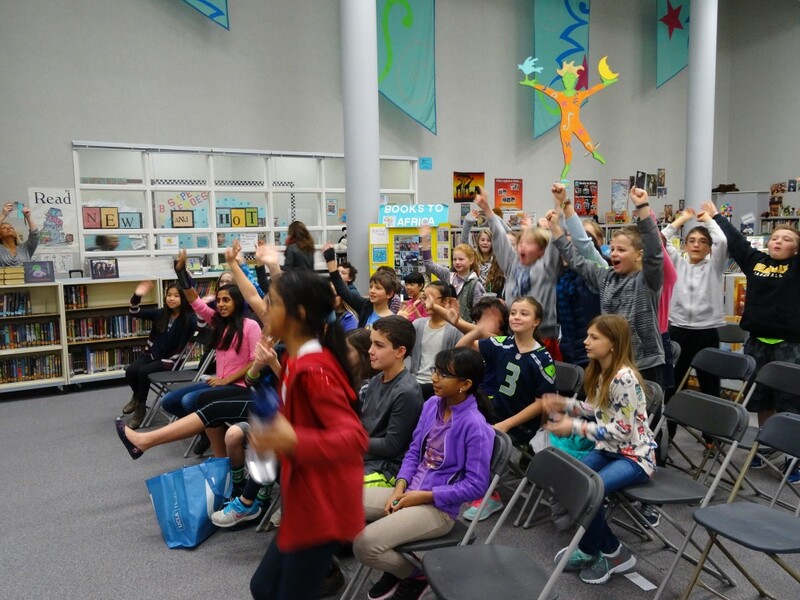 We have Tara Lazar scheduled for a Halloween author Skype visit. I also have some international experiences planned! 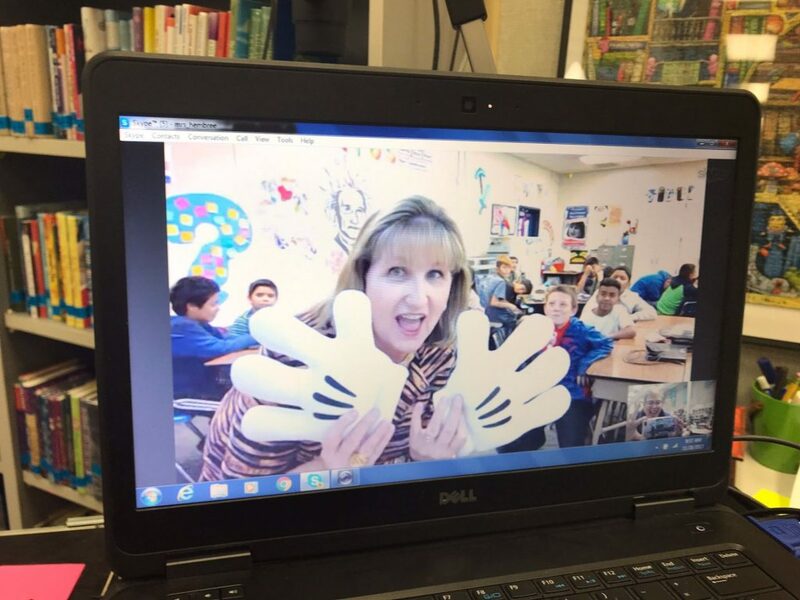 This week, for GlobalMakeDay on October 25th, we Skyped with Karey Killian’s class in Pennsylvania. 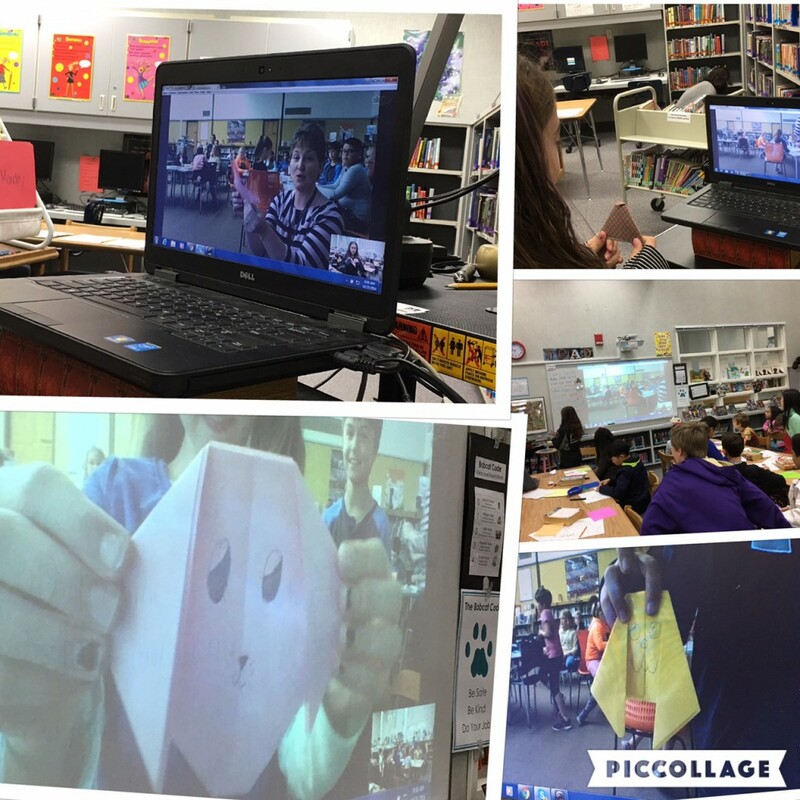 We tried something completely new and my students taught her students how to fold an origami dog by explaining the directions via Skype. It wasn’t easy to just have a small camera as the only way to communicate, but it worked! 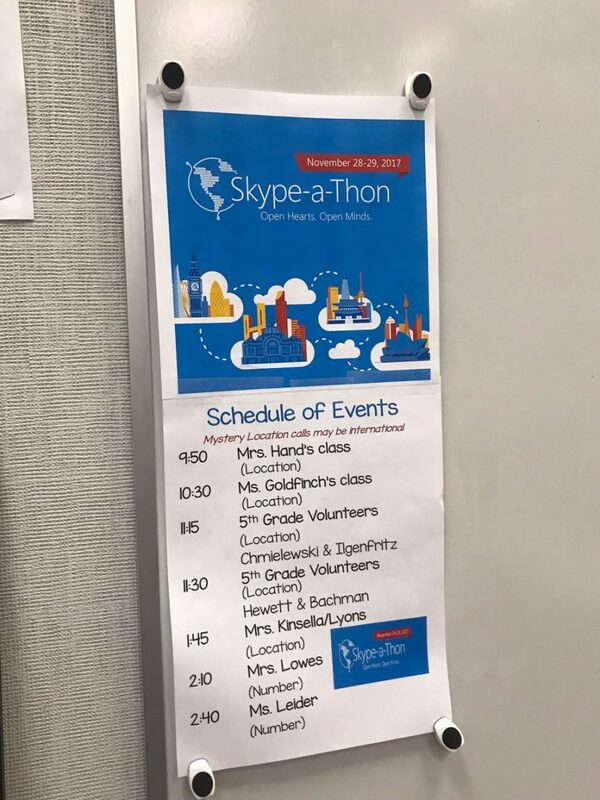 However, my biggest point is that anyone can use Skype to flatten the walls of their library or classroom. 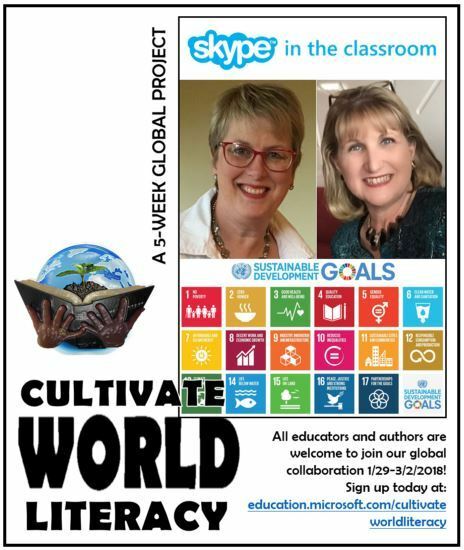 Teachers can join for FREE the Microsoft Educator Community where they have access to Skype in the Community, an online community that enables thousands of teachers to inspire the next generation of global citizens through transformative learning over Skype. 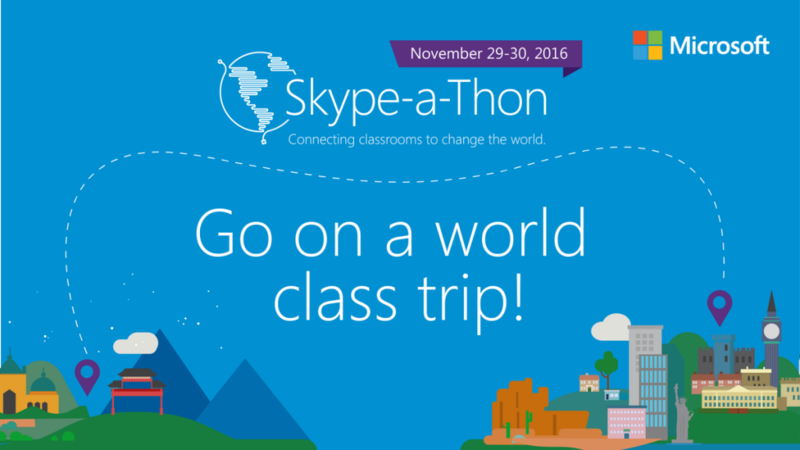 Teachers can bring the world of Skype into their rooms with lessons, mystery skype, virtual field trips and guest speakers. 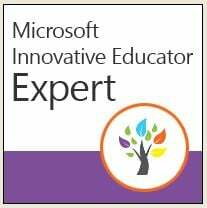 There are numerous lessons available and if you are an expert in your field, ways to share your expertise with others via Skype. 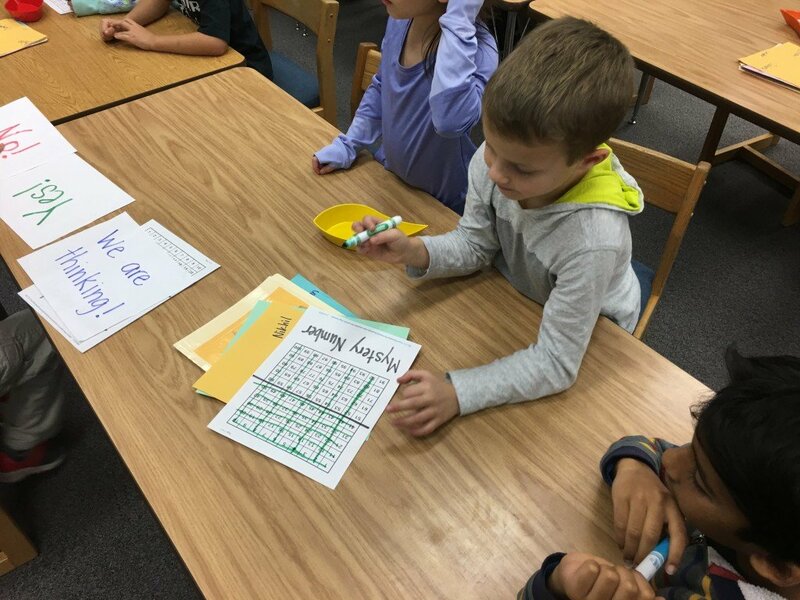 With the youngest students you can play mystery animal or mystery number and guess which special animal the other class has been studying. Really, age doesn’t matter when it comes to these games. 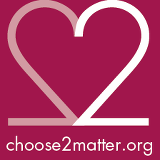 there is literally something for everyone from grades 5-12! If you have never used Skype before and have no idea how to get started, the introduction video will make each step easier than you ever realized. 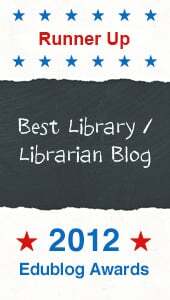 So, in the days of dwindling budgets, you don’t have to lament the fact that you can no longer afford to bring guest authors inside your classroom or take your students on those beloved field trips. Take them to Mt Everest instead or talk to a favorite author on the computer. It might not be the same as what you’ve always done in the past, but it very likely might be much better! 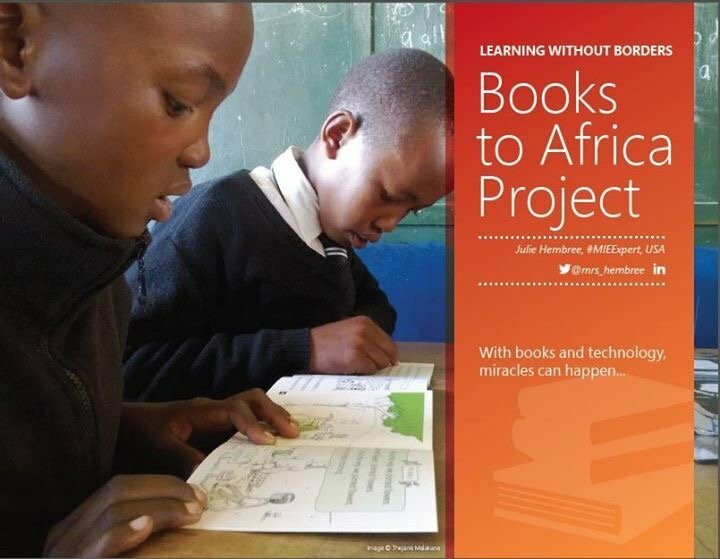 This has been a very special couple of weeks for our books to Africa program.Our international reading project was featured in the first issue of Microsoft’s Innovative Educator magazine last week. 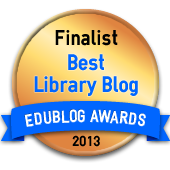 This magazine is filled with stories, tips and helpful information from teachers. 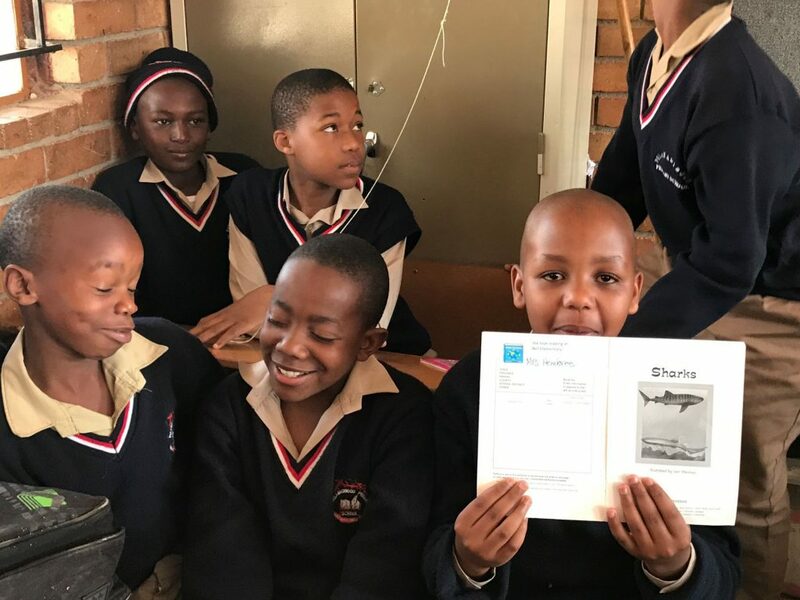 Our article is on page 35 and showcases the impact this project has had on the teachers and students receiving these books. 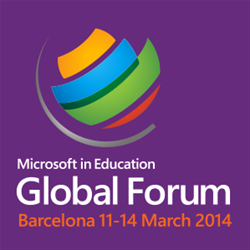 Technology really works wonders with tearing down the classroom walls and bringing the world inside our classrooms. 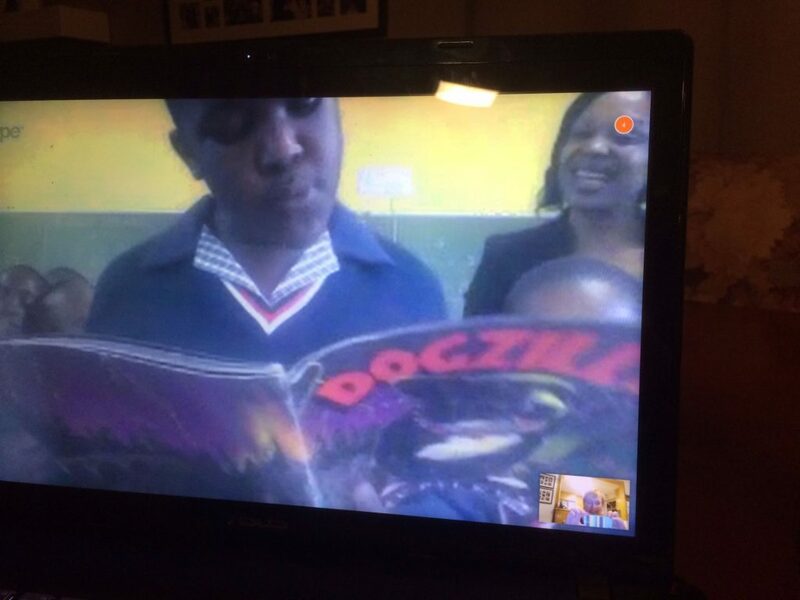 Last week we Skyped with some of the students at Pula Madibogo Primary School. 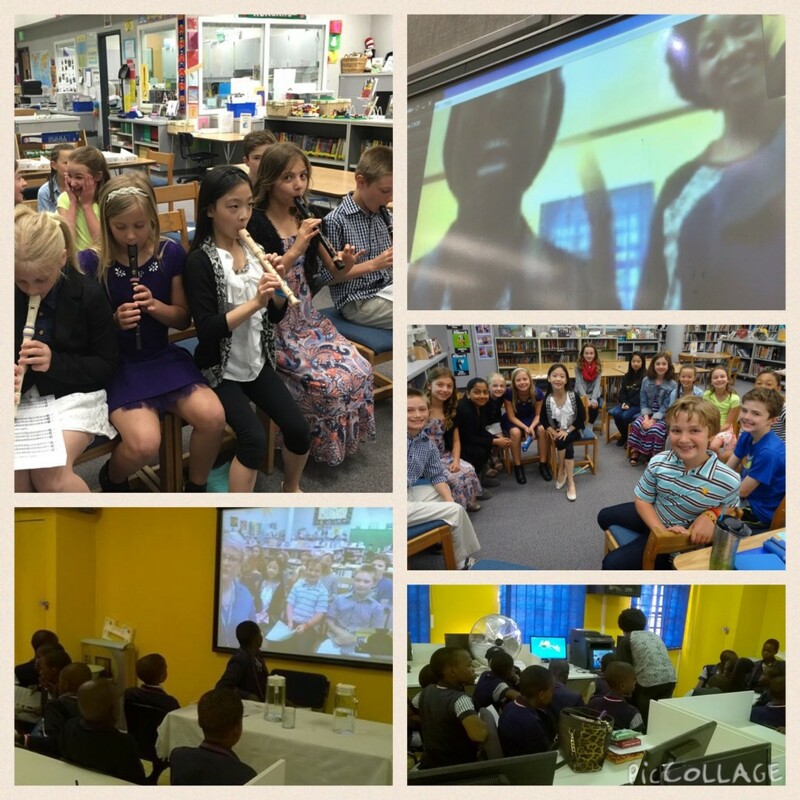 We shared facts, we had an impromptu recorder mini-concert and students shared poetry they had written. 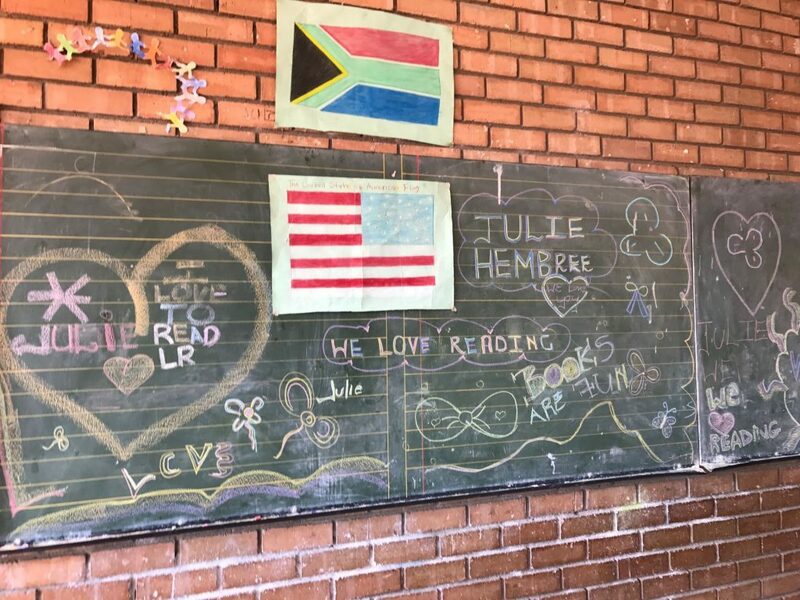 Seeing the faces of the students 10,000 miles away made the connection personal and real for the students on both sides of the world. Suddenly they understood how relevant our project is and how we both benefit from it. 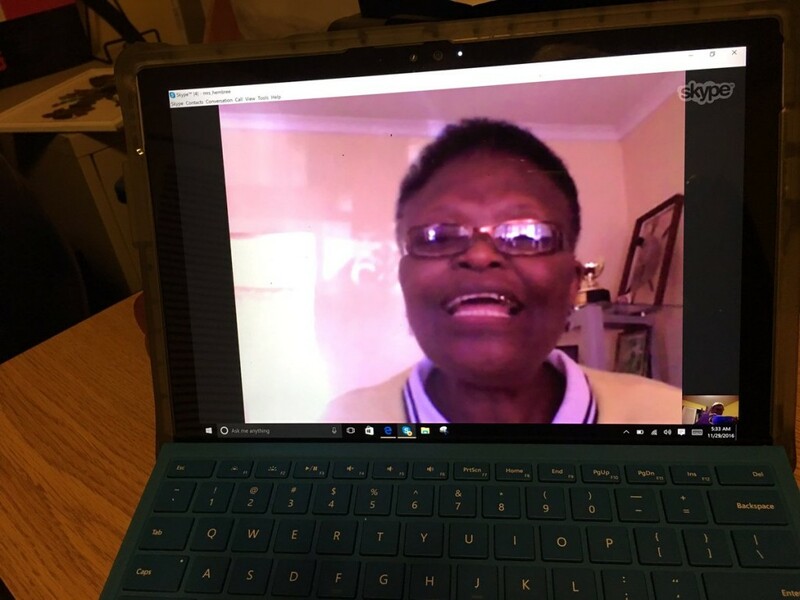 Next week we are Skyping with Thejane Malakane in Maseru, Lesotho using his mobile phone. He doesn’t have internet at his school, but he doesn’t let that inconvenience stop him. A phone with a camera can bring us together as well. 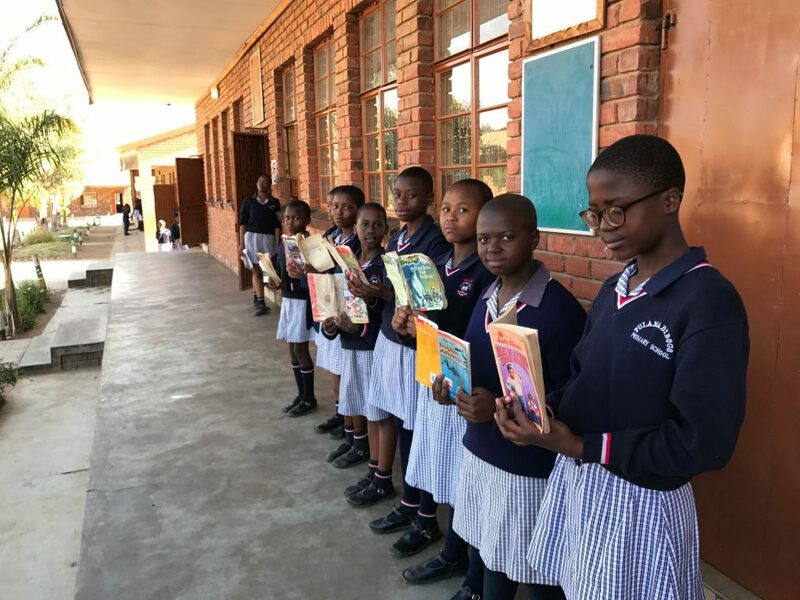 In a few days 300 more books will arrive at Thejane’s school where the students will use them for lessons and free reading. It would be quite the miracle if they arrived in time for us to see his students open these boxes. 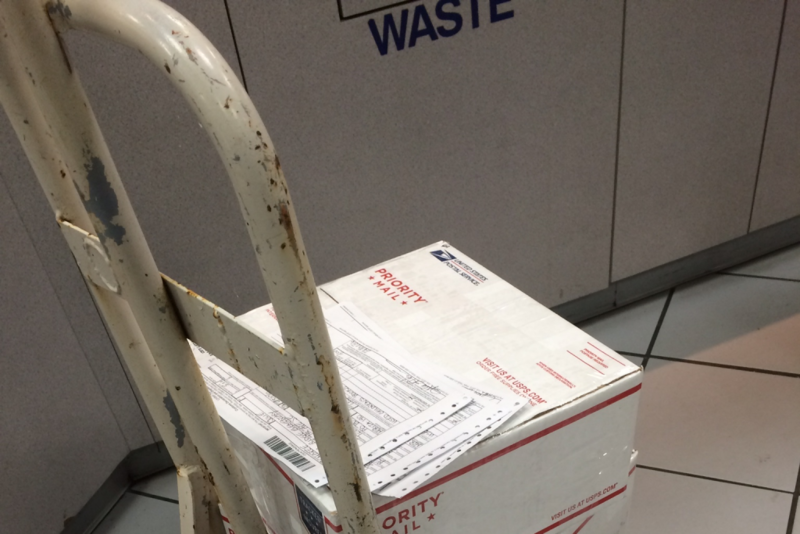 I sent off 4 boxes on April 30th. 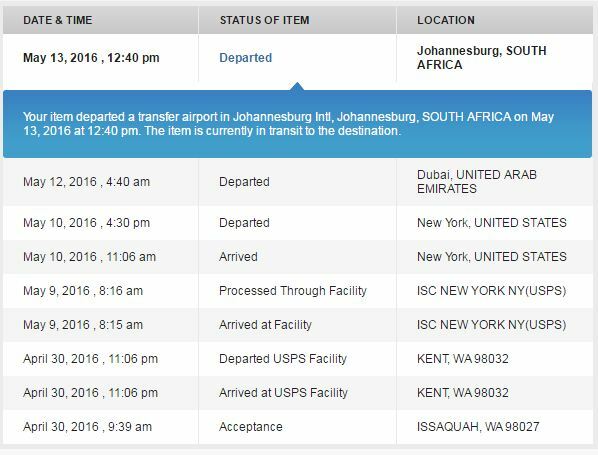 As you can see below, the box went from Issaquah, to Kent, to New York, then Dubai, Johannesburg and hopefully to Maseru for its final stop. 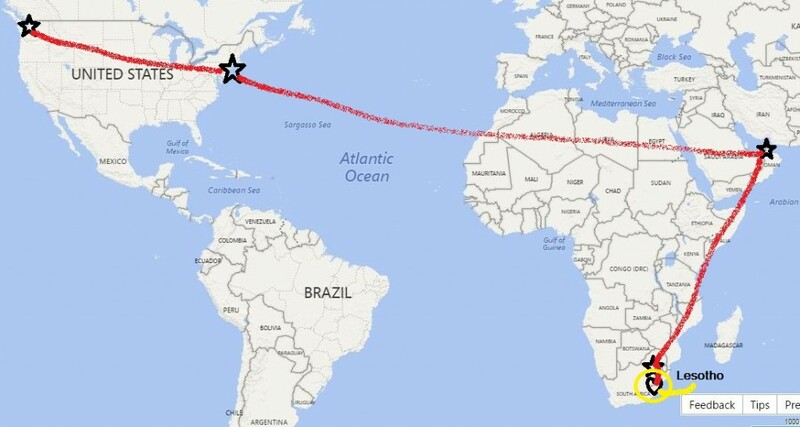 The tracking information is so helpful because I can see where the boxes are, if they are together and when they arrived at the destination. Sometimes communication between the post office and the schools needs a boost, so I try to let teachers know when the books are there. Whether they get there in time for our call or not, we are having a great time packing up and sending off the boxes. We raised about $1500 and roughly speaking that means we will be able to send about 1500 books this year. 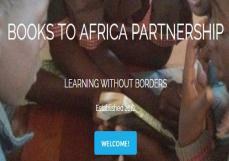 Since our program started I estimate we have sent about 6,000 books to Africa. 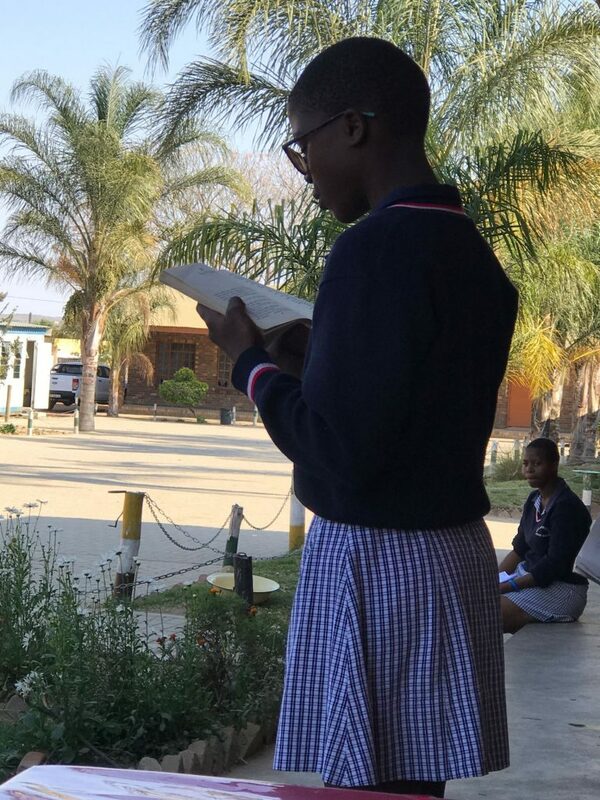 We are changing lives one book at a time! 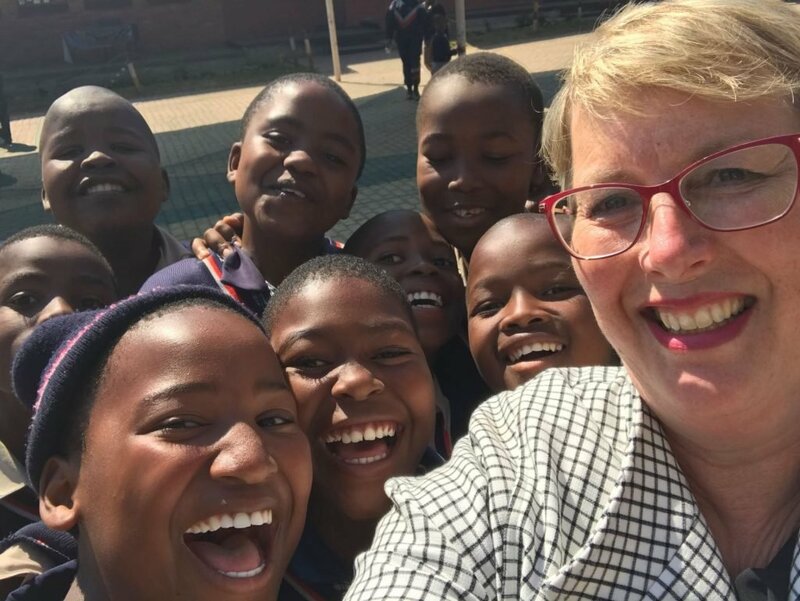 What do you get when you combine 120 students in two classrooms in two different continents to share their research? 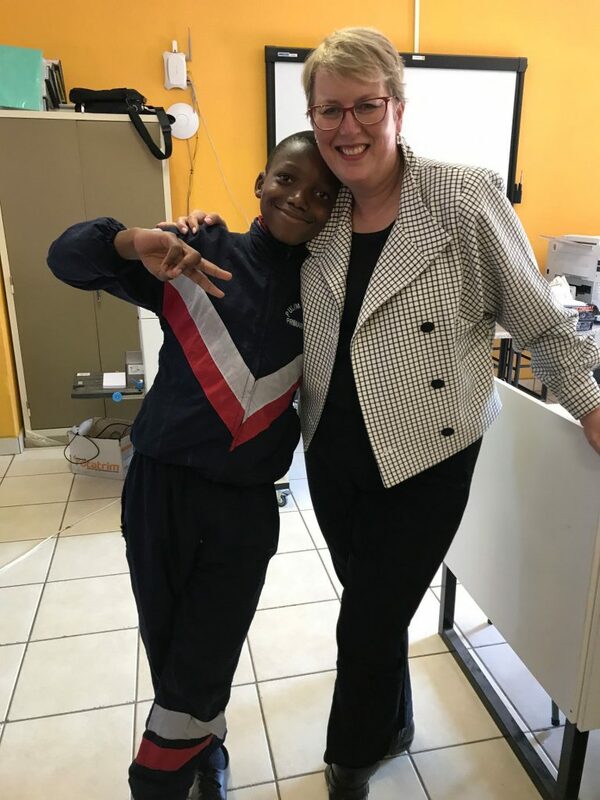 A cross continent learning round up of course! 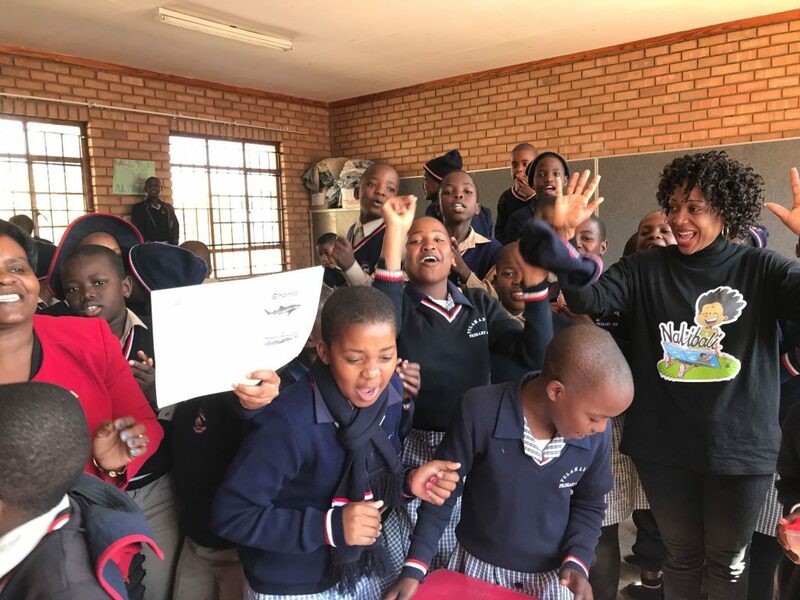 This morning (7:30 am Seattle) and afternoon (5:30pm Durban) our two schools – Cougar Ridge Elementary in Bellevue, Washington, USA and Highbury Preparatory School in Hillcrest, South Africa made the world a little smaller via Skype. 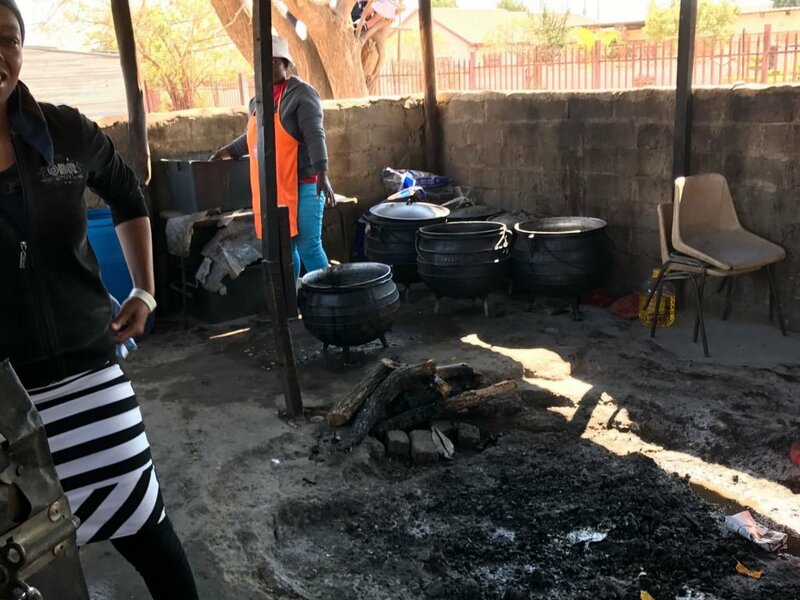 Our students walked into the library with breakfast and the boys at Highbury were looking forward to a South African “braai” which is similar to our barbeque. Their head master (principal) was cooking a special kind of sausages for all the 5th grade boys. 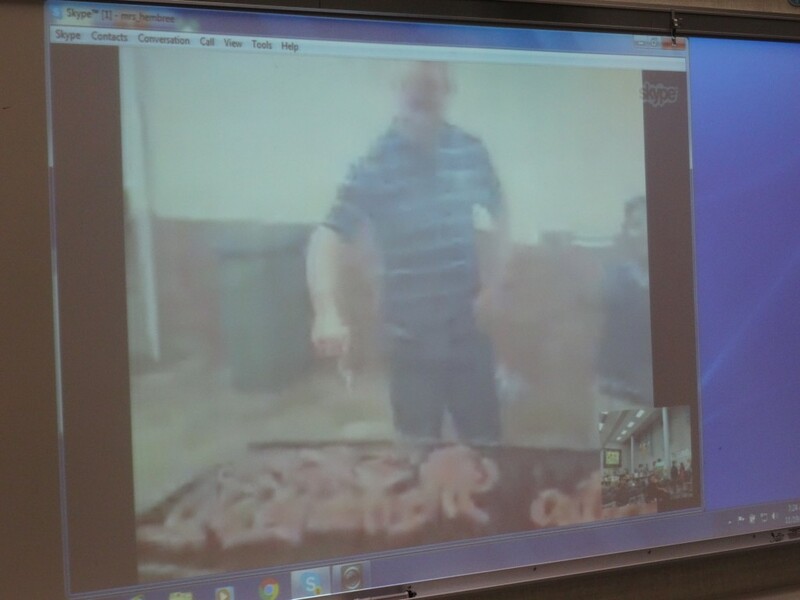 The head master of Highbury cooks boerewors (sausages) while the boys Skyped with us. 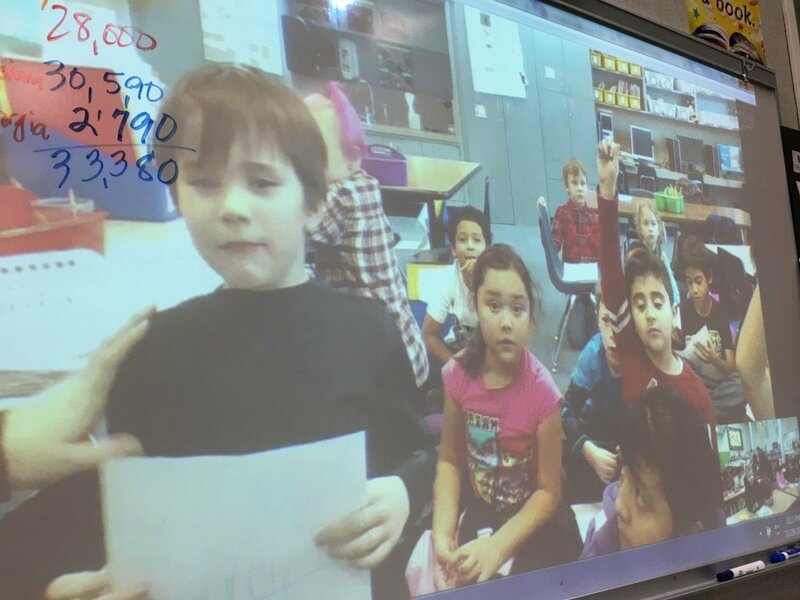 These students broke down the physical classroom walls and connected virtually for nearly an hour. Their conversations crossed two continents and 13,000 miles. 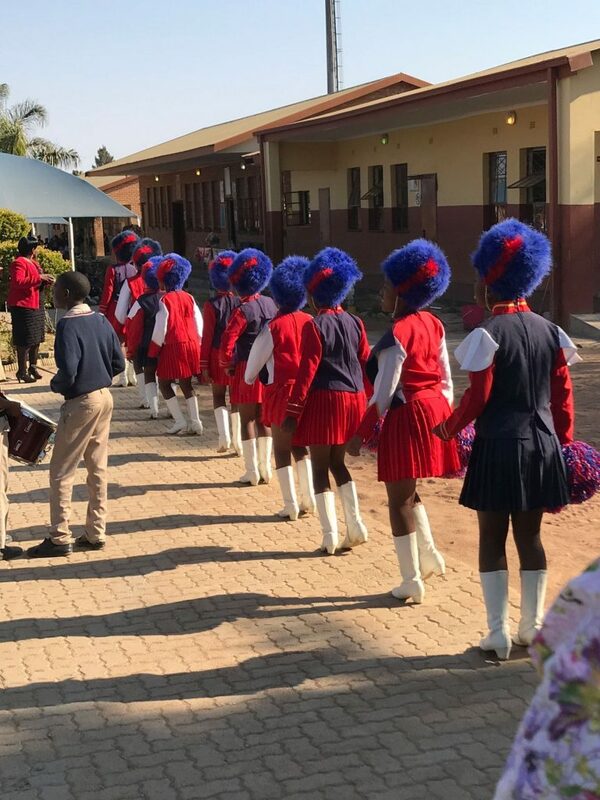 It’s a perfect diagonal line between our schools from the northwest corner of the US to the southeast corner of Africa! 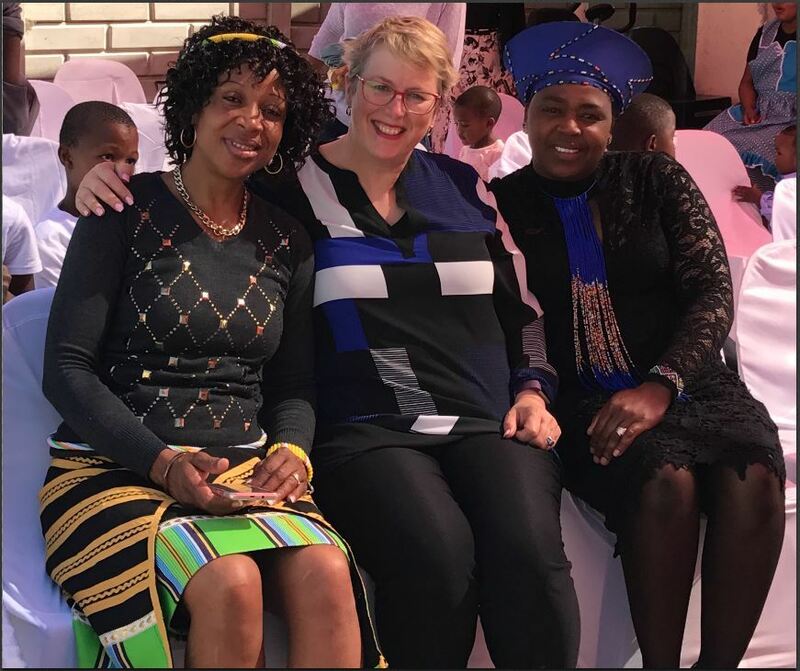 What did they talk about? 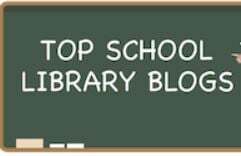 Fun topics that kids are interested in like what does your school look like, what kind of classes do you take, what can you play on outside during recess and breaks, what sports do you play, what are your favorite books or where do you go to get some fast food? This student dressed for the part as he did a quick explanation of American football and our Seattle Seahawks. 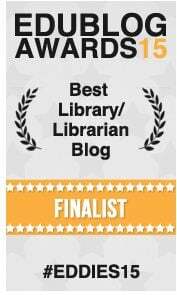 When the librarian Louise MacLeod, technologist Desiree Dunstone and I spoke at Highbury in July, we agreed that our goal was for our students to get to know each other as peers and therefore, the topics they would research and share needed to be kid-friendly. We divided up our 5th grade classes into groups, assigned topics, and the students got busy. 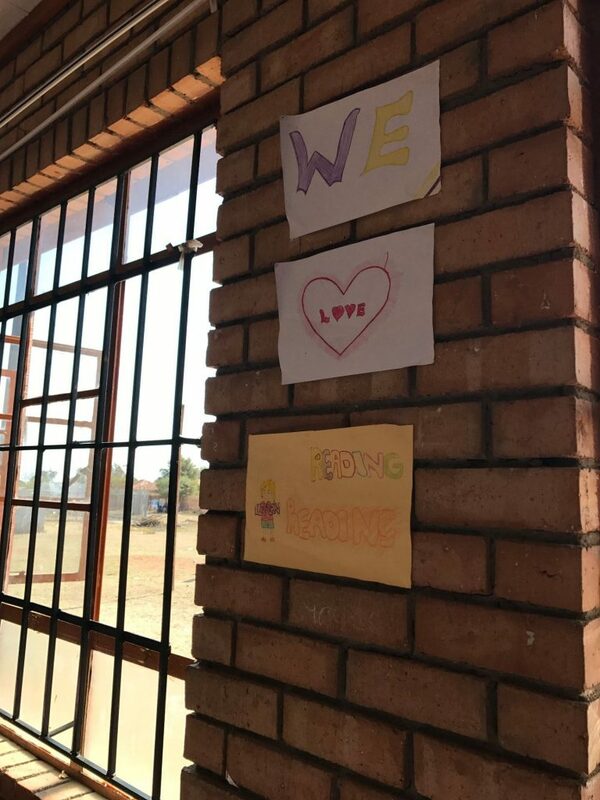 For the past 5-6 weeks, the teams have been collaborating and collecting information to share with their counterpart classrooms. Today was celebration and share day! 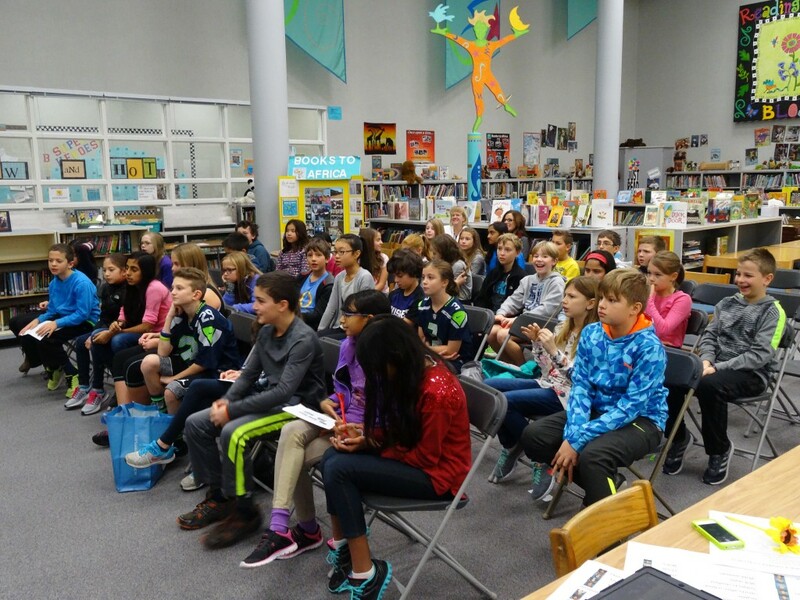 Topic by topic team representatives spoke via Skype sharing pieces of their cultures with one another. With only an hour and 22 topics, we couldn’t go in depth on camera. Each team was only able to share a sentence or two of the highlights of the research. 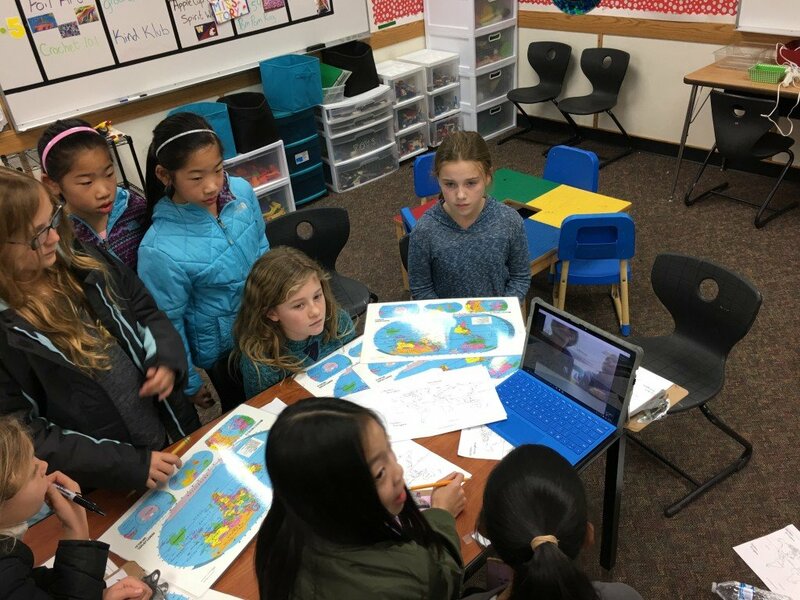 However, with OneDrive, we are able to share the complete research projects with each other and will use class time to view the student work in our respective schools. It turns out we both enjoy going to MacDonalds and KFC! Starbucks isn’t in Durban yet, but we both have Burger King. One group also helped us understand what the Durban “bunnychow” is (a bread and curry sandwich). KFC is popular in Durban. 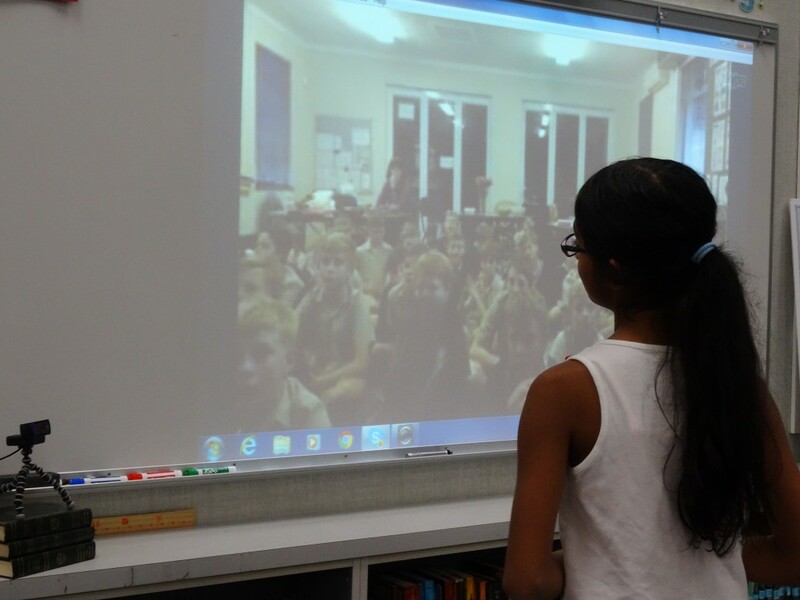 A camera, computer, Skype and a great internet connection brings students from different cultures together. We learned about the Big 5 animals and how there is a serious poaching problem of white rhinos in South Africa. The rhinos are killed for their tusks which are then sold to people in other countries who believe the tusks have medicinal qualities. This group in the video explains that the African elephants have ears shaped like the continent of Africa. 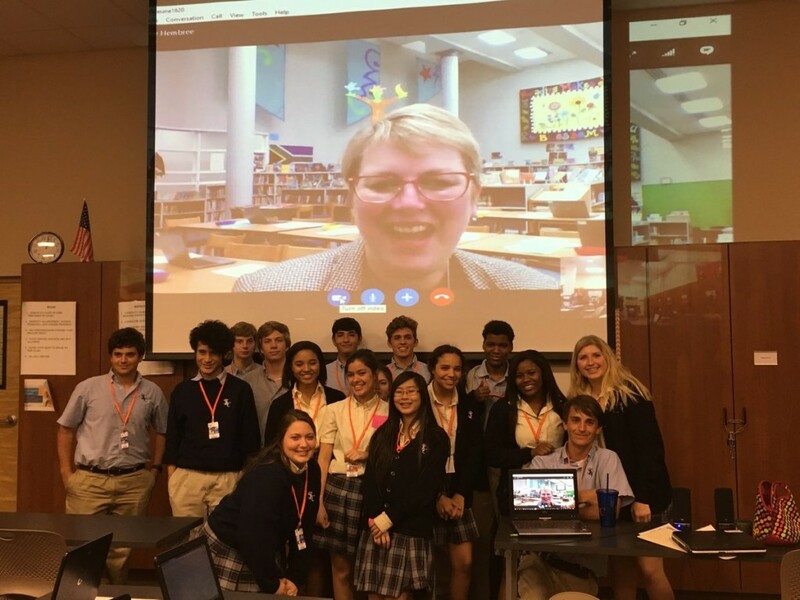 I’ve never taken on a Skype experience on this scale before, but I can say it was worth every second of preparation time. I have listened to the excitement build for weeks and then to see students connecting with each other today was priceless. This morning we were all a little nervous and a lot excited before our call began. Yet, the nerves melted away as everyone discovered we are all the same – just separated by continent. 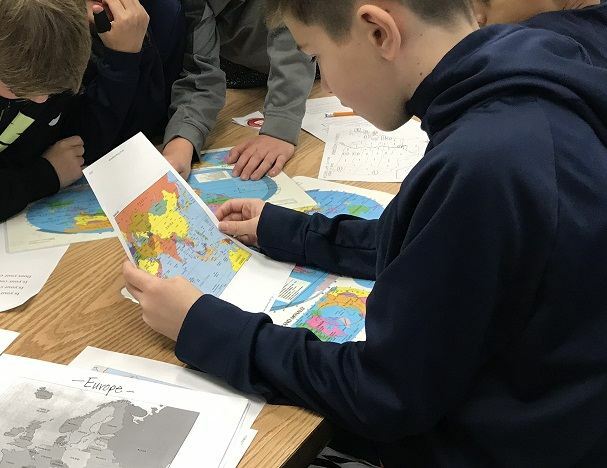 These virtual connections make the world a smaller place and bring the learning inside – without borders. 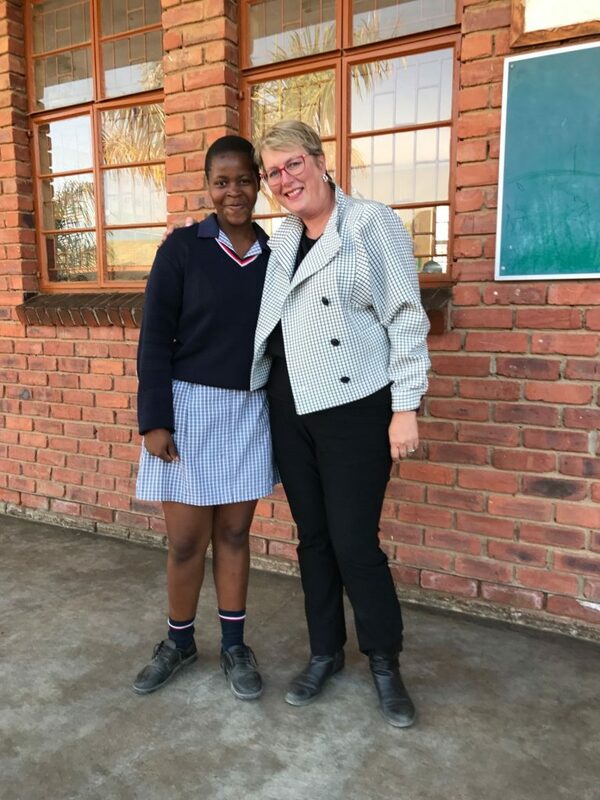 It was hard to say goodbye and I know this is the first of many learning opportunities our students will make. 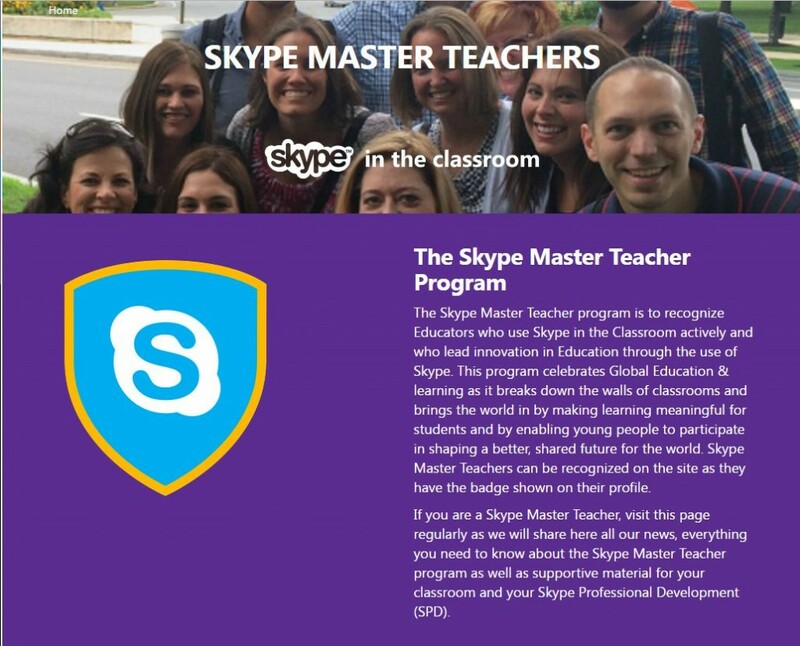 If you want to learn more about how you can use Skype in the Classroom, visit the website. 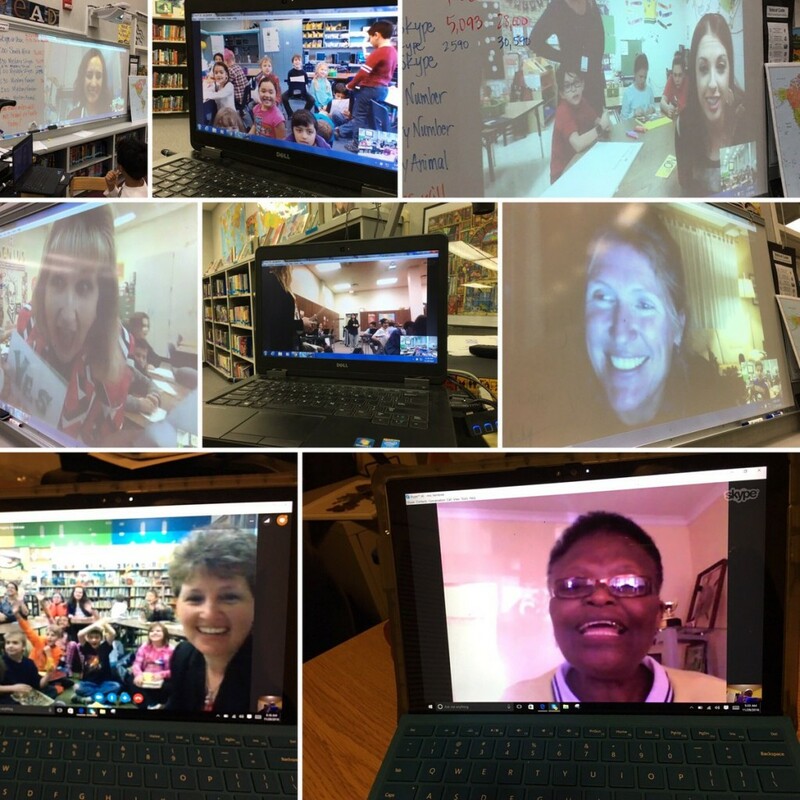 Join the Skype-a-Thon on December 3-4, 2015 and be part of a global movement to celebrate learning without borders. 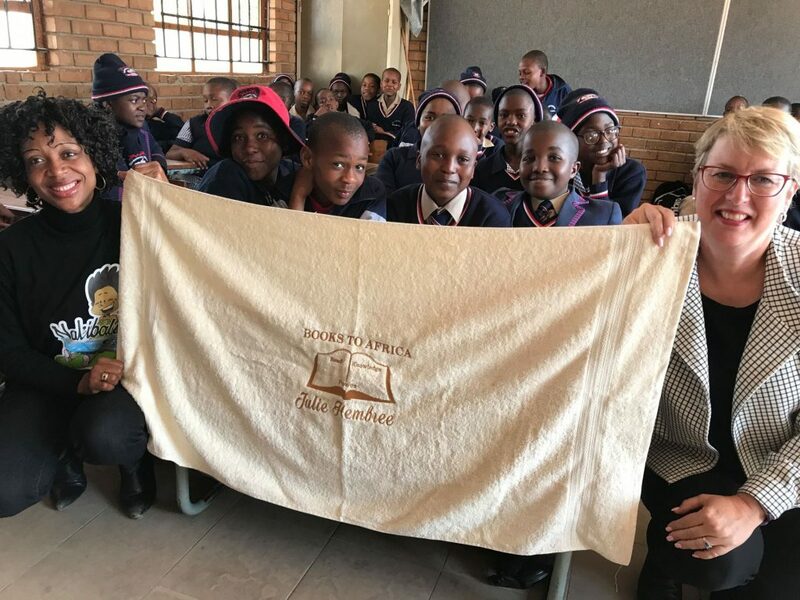 If you would like to learn more about our connection with Highbury Prep and Books to Africa program, here is a post about my trip to South Africa, a video , and a recap of three years of friendship. 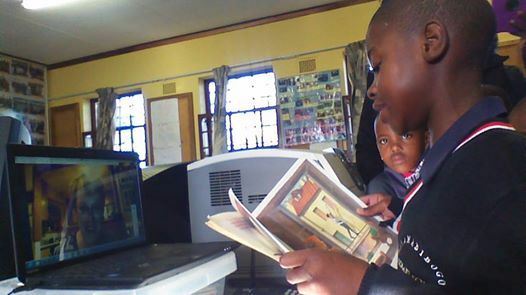 This Sway presentation showcases how reading can extend beyond continent or language borders.